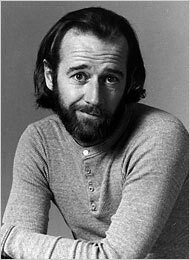 George Carlin (1937-2008) dies in Los Angeles hospital at age 71 from heart failure. I always liked Carlin the comedian, watching hours of his stand-up performance on TV shows like Tonight Show, comedy festivals like Just for Laughs and on DVDs. His skid that I like the most is the comparison of Baseball and Football. httpv://www.youtube.com/watch?v=om_yq4L3M_I There are many of this and other Carlin stand-up performance on his web site and on YouTube.